Driving down NC Highway 12 from the Hatteras ferry, the first bridge you will come to (just past the pony pen) is the span over Try Yard Creek, one of six narrow tidal creeks that connect with Pamlico Sound. All of the creeks are almost certainly remnants of long-ago inlets. Ocracoke Inlet is the only inlet on the Outer Banks that has remained open since Europeans began keeping records. At one time there was a modest whaling industry on the Outer Banks. From 1726 until 1875 New England whalers ventured to North Carolina in February, March and April, hunting the giant cetaceans off shore. Local fishermen were more likely to concentrate on the occasional beached whale, although for a while longboats were launched through the surf to pursue whales. Once brought to shore, the blubber was boiled in large "try pots" to render the fat into oil. Try Yard Creek was named after the nearby area that was once used for trying whale blubber. Following is a transcript of a letter written by John Williams O'Neal (1862-1935) to Brittie Ann Williams (1861-1884) August 23, 1882. They were married on December 1, 1883. The stationery is decorated at the top with an artistic banner. In the middle of the banner is the head of an eagle. To the sides and below the eagle are the words "Yours, Truly, may Heaven prosper you." "My Dear girl I take the plaser [pleasure?] this evning To drop yo a few lines to let yo no that I am in good helth and I am a hoping when theas few lines reaches yo thay may find yo the same good helth. I reckon yo think I have stop riting to yo it has Bin So long since I rote you you must not think eny thing of that for I did not have Time to rite you I come to Philadelphia one nite and left the next morning. 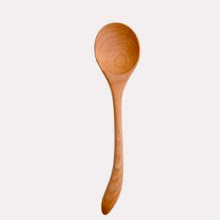 "I wood like to Be thare with yo this evning I think we wood have a nice time dont yo think So Brity Brity I ofton think of the Times that we have been to gether dont yo. "I wont Be long Be fore Il Be home then we will talk things over I ges he set up with yo and Ban [?] and margary one nite tell twelve a clock so I herd I dont no how true it is and if I node it was so I dont think me and yo wood make [?] the rode to gether eny more. "Me and [?] Tolder [Toler] ar to gether and we ar Bound to Boston from here. "I dond no hardly when I shall come home I may Be home in Octtobar or not Be fore So no more at presset I close my letter By Saying good By untill we meet a gane. "from your frind John W. ONeal to miss Britannah Williams. "rite me all of the strange nuse if yo pleas. "rite to port richmon Station E philadelphia pa."
Many thanks to Earl O'Neal for preserving and publishing the letter in his book "O'Neals of Ocracoke Island, Their Ancestors and Descendants"
The Wilma Lee glided up to the Community Store dock yesterday afternoon at about 3 o'clock. Several dozen people were waiting to see this beautifully restored sailing vessel make her way to her new home in Silver Lake harbor. You can read more about the Wilma Lee here. And this summer be sure to come on down to the dock and take advantage of the programs and cruises that will be offered. She is a grand vessel. Ocracoke had two schoolhouses prior to the Civil War. They were both destroyed when Union forces invaded the island. At least one private school was opened in 1868. Twelve students were enrolled. The school fee was "One Dollar per Lunar Month." In 1875 a "free school" was started. Forty-six students were listed on the register. All of the students were born between 1860 and 1869, making them between 6 and 15 years old. John S. McWilliams was listed as teacher. Today, Ocracoke School provides instruction for about 150 students in grades Pre-K - 12. Teachers and staff number 32. 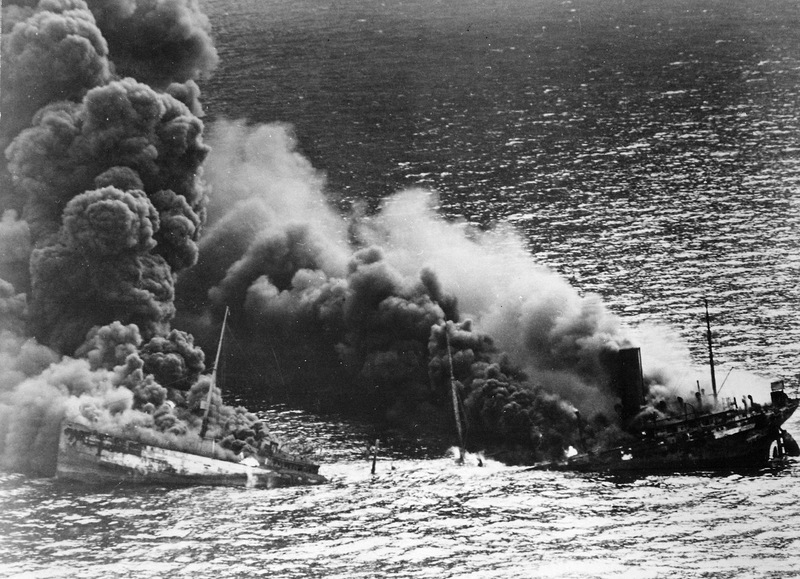 Seventy years ago, on this date, the merchant vessel Dixie Arrow, steaming off the coast of North Carolina and carrying 96,000 barrels of crude oil, was struck by three torpedoes fired from the Nazi submarine U-71. 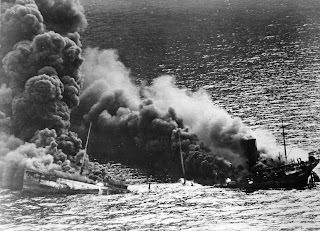 The ship was quickly engulfed in flames, and sank to the bottom of the Atlantic. Eleven of the thirty-three crew members, including 52 year old Captain Anders M. Johanson, died. Their bodies are entombed with their ship off the coast of Ocracoke. Capt. Anders' daughter, Jeanne Revels, who was twelve years old in 1942, has been campaigning for years to protect the Dixie Arrow and the more than 600 other merchant vessels that were sunk in the Atlantic during the first six months of 1942. According to a recent letter from Jeanne Revels, National Geographic will televise an interview with her, her son, and her brother sometime in October. We don't know the exact date of the broadcast, but look for more information in the media as the time approaches. About 40 years ago the National Park Service was having problems maintaining the fence around the pony pen. Every now and then one or more of the ponies would find a way out and wander away. It was not unusual for the renegade ponies to trot over near the surf, where it was breezier, to get away from the biting flies. Inevitably they would leave "souvenirs" on the beach. A visitor to the island stumbled across one of the horse's droppings and picked it up. She carried it to the chief ranger and asked him to identify the unusual object she had found. Ranger David looked at what the woman held in her hand, gave her a quizzical look, thought for a moment, then, with as serious a demeanor as he could muster, replied, "Ma'am, that is quite unusual. Its identity may remain a mystery. All I can say is that in all of my years as a ranger I have never picked one of those up." I have mentioned my outdoor shower several times on this blog. It is enjoyable to use all year long, but it is the best in spring, especially in the early morning. Several large cedars tower over the shower, creating a lattice-work of branches between the shower head and the open sky. Light filters down through the trees in the most calming manner. The songbirds are most active in the spring. Their chirping and singing echo through the early morning hours. Combined with the hiss of steamy water from the shower, the bird songs usher in a new day with the most pleasant of tunes. Theodore and Alice Rondthaler purchased a house on Ocracoke on their first visit to the island in the mid-1930s. It was love at first sight. In 1948 Theodore accepted the position of principal at the Ocracoke School. Alice was hired as one of the teachers. Their tenure at the school lasted 14 years; their love affair with the island lasted for the rest of their lives as they continued to be active participants in the life of this community. As in so many other locales, the weather this winter and spring on Ocracoke has been surprisingly mild. Just the other morning I was remembering the mid-March blizzard of 1980. The temperature dropped into the single digits during the night, and the power went off. We kept warm by huddling in front of the wood stove. The next day we awoke to several feet of snow. This year is quite different. Below is one of the beautiful tulips that are blooming in my yard. Our latest Ocracoke Newsletter is the story of the Civil War on the Outer Banks, Josephus Daniels, Jr, Secretary of the Navy during WWI, and his connection to Ocracoke. You can read it here: http://www.villagecraftsmen.com/news022112.htm. Walking along the beach you might stumble across a string of flat, rounded capsules. These are knobbed whelk egg cases. Capsules are about an inch in diameter, and are made of material that looks and feels like thin, but durable, parchment. Most strands have 50-150 capsules, and each capsule contains up to 100 tiny (2mm-4mm) whelks. I picked up this 8-capsule segment a few days ago. I cut the capsules open but there were no miniature whelks inside. Sometimes these egg cases are called Mermaid's Necklaces. Today marks the Spring Equinox, one of two days in the year when day and night are of equal length. From now until the Summer Solstice the days will be longer than the nights, bringing us more sunshine and warmer weather. As the days continue to lengthen we anticipate more visitors coming to Ocracoke. Shopkeepers are sprucing up their buildings, gardeners are working in their yards, fishermen are repairing their boats, and children are playing outdoors. If you are on the island be sure to smile and wave as you pass by. This is a happy time of year. "The entire school spent 8:30 - 10:30 yesterday A.M. picking up trash; then met back at the school to have a funeral procession. the 'pallbearers' carried the coffin full of trash & beer cans from the school down to Capt. John's Junque Shop [now Down Point Decoys] where the service was held. At the head of the procession was a spur of the moment 'crucifer' carrying a highway sign that said 'Unlawful to Throw Trash on Highway -- $50 Fine.' That sign had been found discarded in the bushes along the road. The replacement sign says '$200 Fine,' and the kids figured the highway workers who erected the more recent sign probably just dumped the old one in the bushes! "There was an electric organ set up at the Junque Shop.... The whole service was really humorous -- & the kids enjoyed it." Ocracoke has had organized litter pick-ups every spring since 1974, but none as elaborate as that first one. One of the most common seashells found on Ocracoke Beach is the calico scallop. They are often colorful with a variety of patterns, usually in pinks and reds. Although many beachcombers pick them up, they are rather common, and not as remarkable as the larger conchs, whelks, and helmets. Below is a photo of a lamp shade made by a friend many years ago. Each one of the scallop shells was found on Ocracoke. Look for these beautiful shells on your next walk on the beach. I recently had a conversation with a woman writing a book about nursing in North Carolina. She was intrigued with how remote the island was until the mid-twentieth century, and with the career of Kathleen Bragg, Ocracoke's first trained native nurse. Kathleen (1899-1975) earned her nursing degree in Rocky Mount, NC in 1923 and returned home to care for her island community. Although medical doctors occasionally set up practice on the island, for the most part Ocracoke was without other medical professionals. In addition to making house calls as a private practitioner and working for the county as the school nurse, Kathleen delivered more than one hundred babies in her long career. Elsie Garrish (1915-2003), another island native, also studied nursing, in the 1930s. Elsie worked in hospitals on the mainland for a number of years, but returned to Ocracoke in 1963. If you look carefully at the 1960s tourist map below (you can click to enlarge the map), you will see Kathleen's house (near the lighthouse) and Elsie's house (on Howard Street) noted. There was no medical doctor, nor clinic on the island at that time. The North Carolina Coastal Land Trust announced that it will begin work this spring on a natural shoreline restoration project, known as a “Living Shoreline”, at Springer's Point. The Living Shoreline project focuses on restoring approximately 500 feet of shoreline near Old Slough. “Living shorelines are alternatives to bulkheads that protect eroding shorelines while creating important estuarine habitat,” said Erin Fleckenstein, Northeast Coastal Scientist with the North Carolina Coastal Federation. An oyster bag sill will be placed offshore and parallel to the existing marsh to create a living breakwater, which will allow a natural aquatic ecosystem to form. The area between the oyster bag sill and the shoreline will then be planted with native marsh grasses. The goal is that the sill will buffer wind and wave-driven erosion so that the shore can accrete and build naturally. At the same time, maintenance work on the existing jetty will also be carried out. The Coastal Land Trust has contracted with the North Carolina Coastal Federation, which has completed more than 20 “Living Shoreline” projects at locations on the coast, including state parks, to design and implement the project. “These projects offer the opportunity to combine shoreline protection with habitat creation for estuarine organisms. We are excited to partner with the Coastal Land Trust to protect the shoreline at Springer’s Point,” said Erin Fleckenstein. “Springer’s Point is very important to Ocracoke and the Outer Banks, so we are grateful but not surprised that so many in the community have stepped forward to help,” said Lee Leidy. Local fisherman will help bag the oyster shell and build the oyster bag sill, and contractors from Hatteras and Wanchese will assist with the maintenance work on the jetty. Volunteers from local schools and the community will be recruited to assist with the planting of marsh grass. The Coastal Land Trust plans to begin the restoration work as soon as possible, but no later than March, and hopes to complete the marsh grass plantings by the end of May.If necessary, the Coastal Land Trust will temporarily close the Preserve to visitors for safety reasons and to promote the success of the project. The Preserve will be open this summer. Funding for the Living Shoreline project at Springer’s Point Preserve is being provided by grants from the U.S. Fish and Wildlife Service, the National Partnership between the NOAA Community-Based Restoration Program and Restore America's Estuaries, and by private donations to North Carolina Coastal land Trust. The North Carolina Coast land Trust works with landowner in North Carolina to save the lands you love at the coast, for the benefit of all North Carolinians. Since 1992, the Trust has helped save more than 48,000 acres of land in 22 coastal counties of the state. The Coastal Land Trust has offices in Elizabeth City, Wilmington and New Bern. More information about the living Shoreline project at Springer's Point and about North Carolina Coast Land Trust is available at www.coastallandtrust.org. I went to the beach yesterday afternoon around 3 o'clock, a little later than I normally go. Imagine my surprise when I walked onto the platform and noticed someone swimming in the ocean! Oh, it was warm yesterday, almost 70 I'd say, but I knew the water was still chilly. OK, it was a child. They're nearly always the first ones in the water in the spring. However, I am proud to say that I have been swimming in the ocean here at Ocracoke every month of the year. The secret is to get out when your inner ear starts getting cold. I also noticed about 30 people enjoying the beach, more than I've seen in many months. Several were strolling at the water's edge looking for seashells; two or three were reading; a few were lying on blankets catching a few rays; others were walking their dogs; or just standing around chatting. It was the perfect spring beach day. 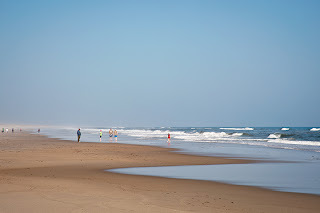 But this is Ocracoke -- I walked about 100 yards to the north, and from there, as far as the eye could see, was nothing but sand, surf, sea oats, and a few seagulls. What a gorgeous day! At least twice I have published my views about Ocracoke and change. You can read my most recent post on that subject here: http://villagecraftsmen.blogspot.com/2011/06/change.html. And listen while I speak. And this, my friend, is wrong. By noisy cars and trucks. The seafood at most meals. "Hoigh Toide at Foive o'clock"
And I don't mean to mock. Would be an awful pity. Sure, there have been changes on the island -- some for the better, some for the worse. But we still have our miles of undeveloped beach, our sandy lanes, our tight-knit community, fresh seafood, quiet winter nights, and a relaxed lifestyle. 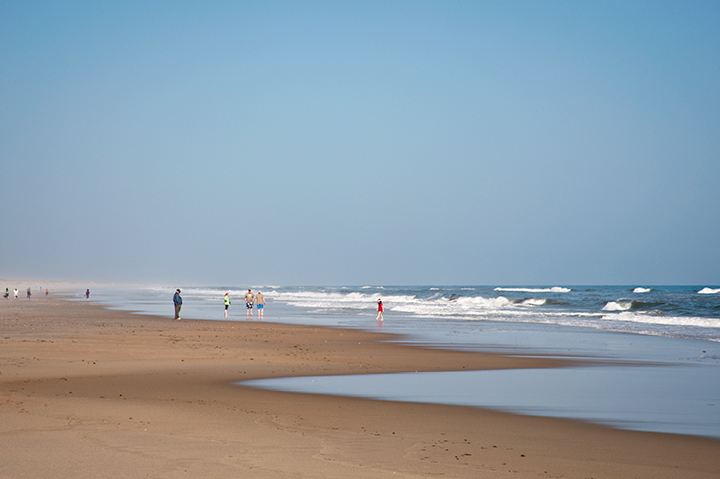 Ocracoke continues to be a delightful place to call "home." March is the time of year when new life springs forth. On Ocracoke camellias and crocuses are blooming. Tulips are poking through the soil, and fresh buds are appearing on shrubs. This is also the season when visitors begin returning to the island and many village stores, shops, and restaurants re-open their doors. Village Craftsmen opens for the 2012 season this coming Friday at 12 noon. Spring hours will be Tuesday - Saturday 10 am - 5 pm; Sunday 10 am - 2 pm; (closed Monday). Stop by and visit. We continue to follow our 40 year commitment to carry only quality US made handcrafts. We love to see our many local and off-island friends. New leaves are bursting forth from our island fig trees. And Ocracoke gardeners are giving springtime thoughts to tending to these iconic trees. On July 16 of last year I posted a short article about the complex and fascinating relationship between figs and fig wasps (every species of fig has a unique species of tiny wasps that fertilizes that type of fig tree). After I published that journal entry I pondered the completeness of the description. Island fig trees are rooted from cuttings, or reproduce by sending supple limbs down to the ground where they root. I questioned if they ever reproduce from seed. A little bit of research revealed that fertilized fig seeds generally come from Turkey or other Middle Eastern locations because fig wasps are native to those areas. I further learned that "persistent" or common figs do not need pollination. I am not 100% certain, but I suspect that all fig trees on Ocracoke are descendants of trees that were cultivated millennia ago, and that their fruit develops parthenocarpicly (without fertilization). So, if you've ever been squeamish about eating figs (and therefore wasp larvae), I think you can relax. I have never seen evidence of fig wasps in Ocracoke figs. This past Wednesday, March 7, marked the 50th anniversary of the devastating "Ash Wednesday Storm" that pummeled the Outer Banks in 1962. The storm, which struck with very little warning, assaulted the North Carolina coast with gale force winds for two and a half days. Higher than average spring tides combined with powerful wind brought extreme flooding from Nags Head to Hatteras Island. A new inlet between Buxton and Avon severed Hatteras Island. When it was over more than 2,000 Outer Banks buildings were either washed into the ocean, otherwise totally destroyed, or severely damaged. Officials estimated the damage to property at more than $234 million dollars. Old and abandoned automobiles were dumped into the breech on Hatteras. Dredges pumped sand on top of the vehicles to finally fill in the new inlet. In 1986 Outer Banks historian, David Stick, wrote a book, "The Ash Wednesday Storm," which chronicled the devastation with photographs and interviews with people who lived through the ordeal and with everyday heroes who rescued countless individuals from the rising tide. The book is a sobering reminder of the power and fury of North Atlantic storms, but I don't believe the book is still in print. Margaret Eaton Howard's legacy lives on in Ocracoke as the story of Mad Mag, a woman of peculiar habits who, among other things, wandered the island graveyards after dark in a long white dress. You can hear more about Mad Mag on our popular Ghost & History Walking Tours during the warmer seasons. Lou Ann has always felt a special kinship with Mad Mag. Several years ago we restored a 100 year old wash house in my back yard, and converted it to a getaway for Lou Ann. She calls it Mad Mag's Studio. If you stop by to visit her studio, especially after dark, keep a wary eye out for Margaret Eaton's ghost! "Town's Airport Not 'Rundown'. Ocracoke, N.C. (AP) -- An airport with a 3,000-foot paved runway has been built on this isolated Outer Banks island so that visitors arriving by air no longer will have to use a highway as a landing strip." I thought our readers (especially our pilots) would appreciate the understatement. Restored Skipjack Donated to Ocracoke Non-Profit, Ocracoke Alive Inc.
Hardly a day goes by that something interesting or exciting doesn't happen on Ocracoke. Today I share some very wonderful news. Because of the generosity of Mr. Herb Carden of Kinsale, Virginia, Ocracoke Alive, Inc., the island's arts and cultural organization, is now the proud owner of one of the nation's last oyster dredging sailing vessels. Mr. Carden had this 70 year old vessel, the 47' skipjack Wilma Lee, completely restored and has donated it to Ocracoke Alive. The Skipjack Wilma Lee, a restored 47 foot, 20 ton, sloop-rigged, centerboard sailboat will soon become a new educational and cultural attraction on Ocracoke Island. The 70 year old boat has been donated to the non-profit organization Ocracoke Alive Inc, which is dedicated to promoting arts and culture on this Outer Banks island. One of only a few remaining Chesapeake Bay Skipjacks, the Wilma Lee is listed on the National Register of Historic Places. The donor and restorer of the boat, Mr. Herb Carden, of Sandy Point, Virginia, had been looking for a new home for his boat for some time when he first opened up a dialogue with Ocracoke Alive last fall. Carden, along with Master Shipwright John Morganthaler, has completed over twenty boat restoration projects, but the Wilma Lee is the one he shows with the most pride. "My goal for rebuilding the Wilma Lee was to do exactly what I have done. That is to see it donated by Liz [Carden's wife] and me, where it will be used to educate the history of its past," Carden said. "I trust that all of you in control of Wilma Lee will make sure that she is used for educational purposes to all the young and old who might have the privilege to sail on her," he added. One of Carden's special hopes for the Wilma Lee is that it will inspire young people to learn a love of boats and boating. Though skipjacks are historically associated with the Chesapeake Bay oystering industry, they eventually made their way south, into the Albemarle and Pamlico Sounds. And in the late 19th and early 20th centuries, North Carolina boat builders were copying the famous design. Skipjacks were a single purpose boat, designed and built for oyster dredging, though Carolina watermen also used Skipjacks for harvesting she-crabs, and hauling lumber and cargo. They are hard working boats with massive sails intended to generate the power necessary to drag a heavy dredge and to work in low wind. Ocracoke Alive president David Tweedie said of the gift, "We are overwhelmed by Mr. Carden's generosity. This is a very valuable gift, but it is also a huge responsibility for Ocracoke Alive." Ocracoke Alive is an Ocracoke-based non-profit organization that is best known for the production of the Ocrafolk Festival and the Ocrafolk School. Tweedie said that Ocracoke Alive will do everything possible to carry out Mr. Carden's hopes for his boat, "to make The Wilma Lee's presence in Ocracoke an educational and cultural attraction that will draw tourism to the island and to the Ocracoke waterfront." According to Ocracoke Alive treasurer Tom Pahl, "It will cost about fifteen to twenty thousand dollars a year just to keep the boat in the water. Plus it will be necessary to plan for repair and maintenance contingencies that will no doubt come up in the future. It is a boat, after all and a wooden boat at that." Pahl explained that Ocracoke Alive agreed to accept the boat only after an exhaustive study of costs and potential income. "The only way we are able to accept this gift is if the boat can generate its own income," Pahl said. To that end, Ocracoke Alive will lease the boat to local sailboat captain Rob Temple. Temple has been sailing the passenger schooners Windfall and Windfall II continuously out of Ocracoke for almost twenty years. The lease agreement will require that a percentage of the Wilma Lee's income be returned to Ocracoke Alive to support and promote educational and cultural programming connected to the Wilma Lee as well as other Ocracoke Alive events and programs. The Wilma Lee's activities will include free programs for the Ocracoke School and off-island school groups, plus a regular schedule of free dockside events, such as historic talks, storytelling and boat tours, allowing curious visitors to learn about the long history of wooden boats and commercial fishing in and around the waters of Ocracoke. "Our hope is that this boat will draw people of all ages and interests to the waterfront, in much the same way that the Elizabeth II brings folks to Manteo," Tweedie said. "We want this to benefit everyone – we want visitors to have a memorable experience, we want to advance the notion of Ocracoke as a destination for those with a taste for maritime history and we want to bring more people down to the waterfront." The Wilma Lee was built in 1940 on the Maryland shore. It is one of the younger boats in the fleet of around 32 skipjacks still afloat. Over the years, about 800 of these boats sailed the oyster-laden waters along the Maryland, Virginia and Carolina shores. The last remaining North Carolina-built skipjack was built in Rose Bay (Hyde County) in 1915. Named the Ada Mae, it's now used for educational purposes as part of Carolina Coastal Classrooms in New Bern, NC. The skipjack Wilma Lee is expected to make its debut entrance into Ocracoke harbor around the Easter holiday. For more information about the Wilma Lee and Ocracoke Alive, go to www.ocracokealive.org. This is Bill. On a recent beach walk with Philip I told him about an experience I had recently had and he asked me to "write that up for the blog". So here goes. Ocracoke High School English teacher, Charles Temple, recently announced his intention of directing a production of Macbeth this spring and invited "actors" from the community to audition for roles along with the mostly student cast. I had so much fun two years ago in A Midsummer Night's Dream that I showed up again this year and was generously given a role. And so that's how I found myself in the English classroom this past Saturday afternoon with about ten teenage students and our director. We spent an hour and half reading through Act I and talking about nearly every exchange of dialogue and "what was going on there." The amazing thing to me was how, as far as I could tell, we all seemed to be having the time of our lives...as if we'd rather be there doing that than almost anywhere else! For an hour and a half. Saturday afternoon. Macbeth. What fun! Teenagers! Now I've got to start memorizing my lines. This winter more than a dozen people joined Judith Saunders for a Basket Making Workshop here on Ocracoke. 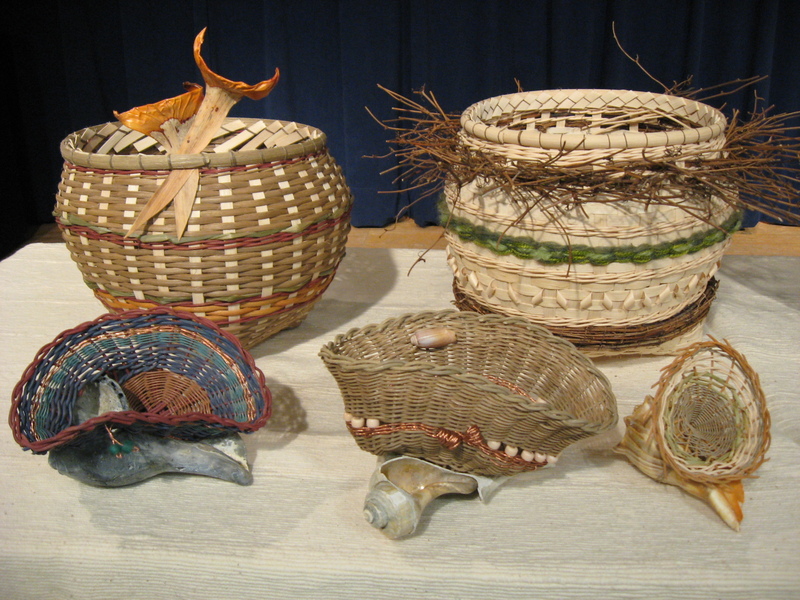 The "Island Weavers," as they call themselves, will be hosting an Open House / Exhibition of Basket Creations this evening from 6:30 - 8:00 at Books to be Red on School Road. Light refreshments will be served. Come on out to celebrate island creativity! No one seemed to know where to find this tree. That is not too surprising because it is not particularly obvious. However, the dragon tree is on public property. It is one of the trees at Springer's Point, right where the path ends at the beach. The "dragon's head" is difficult to see. It is obscured by the branches on the left side of the photo. But if you look carefully on your next visit to Springer's you should be able to find it. Good luck. ...that is the name of a 1985 book by Roger L. Payne. Unfortunately, the book is currently out of print. At nearly 200 pages the book lists hundreds (probably several thousand) names of islands, inlets, marshes, hammocks, creeks, villages, dunes, shoals, swamps, etc. in Carteret, Currituck, Dare, and Hyde Counties. On page 23 Payne includes a table of the "Grouping of Names on the Outer Banks According to Type of Name" (based on eight categories established by H.L. Mencken in his book "The American Language"). If you come across Payne's book in a used book store, consider purchasing a copy for yourself, or to donate to the Ocracoke Preservation Society or to the Ocracoke Library (I am not sure if they have a copy or not). Every now and then, even when we haven't had any stormy weather, a beautiful shell will wash up on the beach...and I will just happen to be the first person to walk by. That happened a few days ago. There, right at the high tide line, was this perfect, unbroken lightning whelk, a treasure from the sea, as they say. On Tuesday I had the opportunity of a lifetime. My friends, Rob & Steve and I were invited to spend a day with Ed Farley, captain of the skipjack H.M. Krentz, on the Chesapeake Bay dredging for oysters. We met Ed at sunup on Deal's Island, Maryland. By 6:30 we were on board with six other crew members. After a hearty breakfast of eggs, potatoes and scrapple we arrived at the oyster beds. From then until sundown the H.M. Krentz, built in 1955, worked the oyster beds several miles out in the Bay. Although the H.M. Krentz is a sailing vessel built especially for oystering, she was accompanied by a "push boat," a small yawl powered by a 150 hp diesel engine tethered to the stern, and controled at the helm of the skipjack. The dredges were tossed overboard, one on each side. After a couple of minutes the winder motors were started and the dredges were hauled back on deck and emptied. Over the side went the empty dredges, and down on their hands and knees went the crew, three on each side, culling through the heap of shells. Legal size oysters were tossed behind the men, and empty shells & smaller oysters were pushed back into the water. After only a brief interlude the dredges were hauled back to the boat. Over and over this process continued...until noon. Then the crew went below deck for their dinner of ham, sweet potatoes and green beans. After 30 minutes they were back at their stations, working the dredges until the sun sank below the horizon, twelve hours after we left the dock. By the end of the day the H.M. Krentz and her crew had harvested 53 bushels of oysters. It was all in a day's work. Audrey Penn has written a number of children's books. In addition to "The Kissing Hand" and other books for young children, all familiar to teachers, school librarians, and parents, Audrey has written three novels for older children (and adults) loosely based on the story of Blackbeard the Pirate and Ocracoke Island. I have been honored to illustrate "Mystery at Blackbeard's Cove," "Blackbeard and the Sandstone Pillar," and "Blackbeard and the Gift of Silence." Do any of our readers recognize this tree? Do you know where it is? (I will post the answer in a few days.) By the way, the books are available here: http://www.villagecraftsmen.com/islandbooks.htm.